A vegan gastroenterologist and a bacon-loving, diabetic chef walk into a kitchen. Stop me if you've heard this one. It’s the start not of a joke, but of a game-changing evolution in how the medical community approaches human wellness and disease prevention. “Medicine is at a turning point, and it’s going to be such a tectonic shift that we’re going to have to rethink everything we know,” said Meenakshi Budhraja, a gastroenterologist keen on keeping her peers ahead of the curve. In part, that means shifting medical interventions to the top of the proverbial cliff, she said, so we can rely less on the ambulances, hospitals and disease treatments now parked at the bottom of the cliff to heal us after we fall off. Medical practices of the future will be predictive, preventive, personalized and participatory, or what is being called P4 Medicine, Budhraja said. A first step toward that is changing unhealthy food habits. Source: Centers for Disease Control and Prevention, preliminary data for 2011. Eight of the 10 leading causes of premature death in the United States are profoundly influenced by what we eat, she said in a talk to physicians and their families at a recent “Healthy Food, Healthy Living” conference held at the University of Arkansas’ Winthrop Rockefeller Institute. In the kitchen lab, Executive Chef Robert Hall of the Winthrop Rockefeller Institute welcomed physicians and their spouses as Jim Gaffigan’s comedy routine on bacon played in the background. And for a chef, just knowing what to eat is not enough. There has to be some accounting for taste, even if you can’t incorporate favorites such as bacon into every meal. In pairs, the physicians learned to cook healthy dishes with international flair and flavor such as antipasti salad and dressing, coconut shrimp curry, Korean-style chicken wraps and ratatouille. There were even recipes for desserts—double-chocolate brownies and peanut butter mousse—that offered lighter substitutions such as yogurt for fats and cocoa powder for sugar. Doctors often used the word “intimidation” when talking about how most people feel about cooking and the kitchen, Hall said. “The reason most people don’t cook isn’t time or economy, though those are often what we use as excuses. The reason is they just don’t know how. Students sample native foods prepared and delivered to their classroom in El Alto, Bolivia, by their mothers. The feast was part of nutrition lessons supported by Heifer and its partners. Hall doesn’t have all the answers, or know anyone else who does. "Cooking is a skill that has to be acquired, either by learning from someone more experienced or by simple trial and error. I hope participants of this kind of class and program come away with at least a little understanding that cooking is not as difficult or complex as one may have previously thought,” he said. In its second year, the Arkansas conference focused on nutritionally responsive disease, said Alecia Hamilton, event organizer and director of continuing medical education at the University of Arkansas for Medical Sciences. Doctors who exercise are more likely to recommend exercise to their patients, Budhraja said, so it should follow that physicians who cook would be much more likely to send a patient home with a culinary prescription rather than a statin. “Doctors can tell you what to eat, but chefs actually know how,” Budhraja said. “They are the ones who have the ability to translate and actually fill a dietary prescription. Chefs have not traditionally thought of themselves in that light, that’s why it is so amazing to work with them in this way. Healthier cooking and eating practices go a long way toward preventing many medical problems. You can start today with the recipe below. Traditionally, physicians have been disengaged from what patients eat because their training focuses on disease and not how to recognize and quantify wellness, Budhraja said. Hall further clarified why inviting “the other white coat” to a medical conference is beneficial to both sides. “I want you to begin to set the example,” Hall said. “One meal a week more than you do now, cook at home. Cook at least one dinner a week that's not from just a can or a box." Put your garden veggies to work with this simple, fresh and healthy recipe, courtesy Robert Hall, executive chef at the Winthrop Rockefeller Institute. 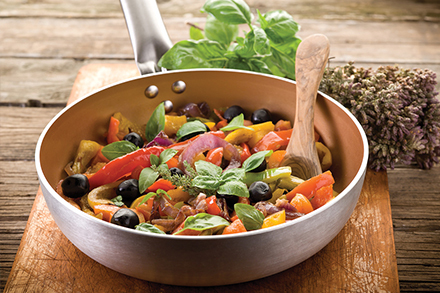 In a large nonstick skillet, heat 1 tablespoon of the olive oil over medium-high heat. Add the eggplant and cook, stirring, until it has softened but not completely lost its shape, about 5 minutes. Remove the eggplant from the skillet. Heat another tablespoon of oil in the same skillet over medium- high heat. Add the onion and cook, stirring, until softened and translucent, about 5 minutes. Add the zucchini and garlic to the pan and cook, stirring occasionally, until the zucchini is softened, 6-7 minutes. 10 minutes. Season with additional salt to taste. Stir in the basil and remaining tablespoon oil.